The highly-anticipated 2015 Outreach 100 issue celebrates the American megachurch. This 164-page print publication celebrates The American Megachurch and features the Outreach magazine/LifeWay Research Annual Report on the country’s 100 fastest-growing churches by region and denomination, as well as informative maps and infographics. 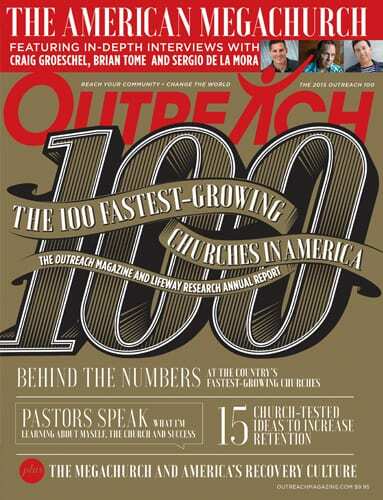 The 2015 Outreach 100 provides Snapshots of the Top 10 Fastest-Growing Churches and in-depth interviews with Craig Groeschel, Brian Tome and Sergio De La Mora. Plus: 15 church-tested ideas to increase retention.